Note on portability: Where possible we have indicated whether something is portable, or at least 'luggable'. Whether or not it is practical to move these things around depends on your circumstances and all the other gear you have to move. Only you can make that determination. 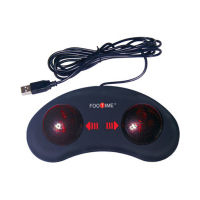 Most inquiries concerning playing music center around postural problems experieinced by the musician. This section includes seating alternatives. 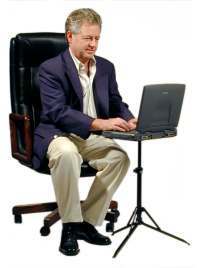 The Mey Chair Systems GIGCHR Foldable Sit-Stand Chair is foldable and weighs 18.7 lbs. 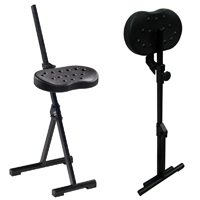 The Mey Chair Systems FYLDST Folding Sit-Stand Stool is foldable and weighs 14.3 lbs. Writing music using notation software requires a lot of repetitive keystrokes. Items in this category help to reduce the amount of keyboarding required. The PI Engineering X-keys XK-24 Programmable Keypad can be programmed so that a single key can perform combination keystrokes (keystrokes that use a modifier key such as Control). PI Engineering makes other models, including a 58 key model. 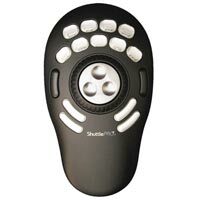 The ShuttlePRO by Contour Design is a productivity enhancement tool for video and audio editors. Sometimes it is necessary to have a laptop or tablet nearby while you are playing, so that you can make quick edits to your composition. Also, when reading music on a tablet or laptop it is often convenient to be able to change pages 'hands free'. 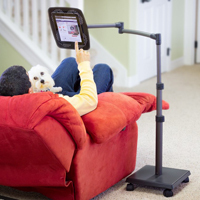 The Carliss InsTand Basic Laptop Stand allows for easy positioning of the laptop. It is also portable, weighing 22 oz. and comes with a carrying bag. 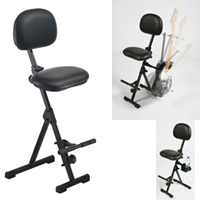 Carliss also makes a sit/stand version and a heavy duty version. 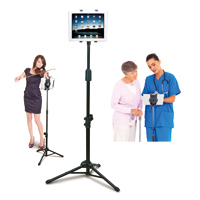 The LEVO G2 Deluxe Table Floor Stand for iPads, Tablets and eReaders allows for easy positioning of iPads and tablets, enabling you to get the music in close. However, at 28 lbs. this is not portable. 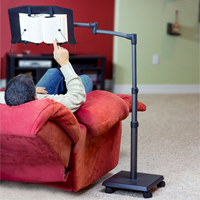 Click here for the LEVO Bookholder Free-Standing Model book holder. Click here for the Universal Foldable Tripod Tablet Stand. 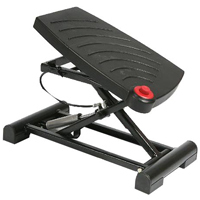 The BiliPro Page Turner has two foot-operated switches that perform PgUp and PgDn functions for hands-free page turning. 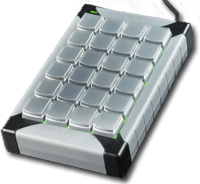 The Kinesis Savant Elite2 Dual Action Foot Switch can be programmed to perform mouse clicks and keyboard shortcuts. 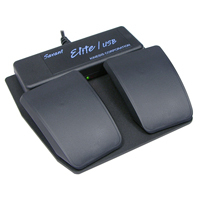 The Savant Elite2 also comes in 3-pedal and 1-pedal models.